Eliminate the Hassle. Eliminate the Uncertainty. Selling your house shouldn’t be filled with surprises, difficulty or a uncertainty. Looking for simple steps to sell your house quickly? Look no farther! By using the above “Four simple steps to quickly selling your house” you can receive the following benefits. I’m not an agent looking to list your house. I’m looking to buy houses in the greater Sacramento area. You can sell your house quickly because I pay cash. You avoid dealing with banks, difficult lenders, long drawn out escrows and having lots of people in and out of your property. That’s right – I pay title and escrow fees, city and county transfer taxes and for any necessary repairs. You don’t need to be surprised by hidden escrow fees. And to make sure you aren’t surprised, before the close of escrow, our title company will send you an estimate of what you’ll receive at closing. You won’t lay awake at night worrying about some buyer backing out because they got “cold feet” at the last minute because their inspector found something. You won’t be surprised by buyers who suddenly don’t have all the money needed to close and at the last minute asking you to help with their closing costs. Have you ever received an offer for something, accepted it, only to have the buyer come back and demand more? They find this thing or that thing and slowly begin asking you for more and more discounts because of such and such. The offer I write expects a certain amount of unanticipated repairs so you can avoid all of the back and forth. What does that mean for you? 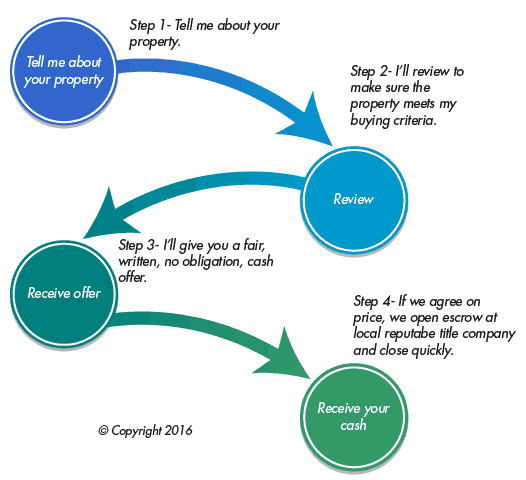 You can sell your house faster skipping long drawn out negotiations. Have you ever had the sale of a house fall through because at the last minute the buyer got cold feet? The buyers’ home inspector scares them with something that shouldn’t be a surprise, but they walk away from the purchase. It’s a common occurrence when selling to the general public. I do this for a living and have seen just about everything. I’m not looking for the prettiest house in the neighborhood, as a matter of fact, ugly is better. You can sell your house fast and skip the cleaning! You don’t have to clean the house, get rid of junk or anything else to get ready. I will buy your house in as-is condition and deal with whatever is left behind. Anything of value, I’ll donate to local charities and can even give you give the receipt for the items left behind if you let me know ahead of time. If you have a specific charity you want items to go to, let me know ahead of time.